Arkansas borders six states. Can you name them? (As full disclosure, I couldn’t either. I stalled out at four, and one of them was wrong to boot.) Check out this map for help. One of the states is Louisiana, directly to the south. After Hurricane Katrina, more than 50,000 evacuees were taken in by the state of Arkansas. Some 9,000 of them were temporarily lodged at Fort Chaffee, the military base here in Fort Smith, Arkansas. (For those just tuning in, I've been telecommuting from Fort Smith for the past week.) I had wondered if I’d meet any evacuees still in the area, and yesterday, I did. This gregarious New Orleans native remains in Fort Smith with her husband and two daughters. 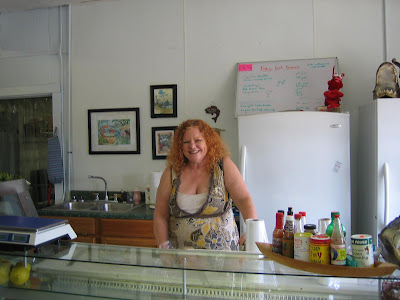 A psychotherapist in her past life, she keeps her hometown spirit alive by running The Shrimp Shed, which serves homemade New Orleans fare. I had the rich gumbo along with her signature crawfish cornbread. Want a drink to go with your food? Better go put 60 cents in the soda machine. “This ain’t no five-star joint,” she told me merrily. Here, the word “shed” is not something cute and cheeky. The place is literally a roadside shack. The charm (and there was plenty of it) comes from the big personality behind the counter. 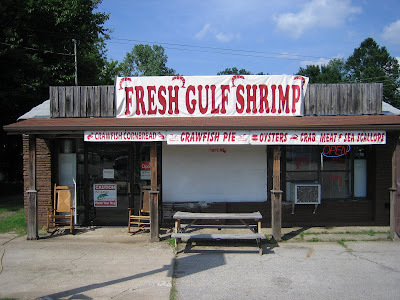 It's places like The Shrimp Shed that make me think I could connect with this place. The question is, for how long?